LOS ANGELES (AP) The Los Angeles Lakers spent the morning giving themselves the financial flexibility to sign two free agents to max deals. When the day was over, a win by their largest margin this season showed they have more to sell than cap space. 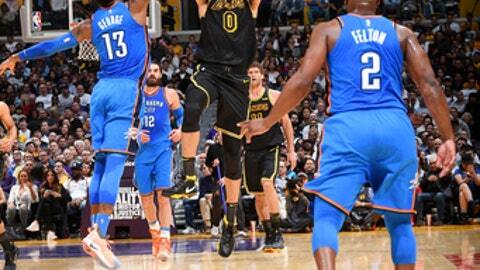 Kentavious Caldwell-Pope scored 20 points, and the balanced Lakers defeated the short-handed Oklahoma City Thunder 106-81 on Thursday night. Brandon Ingram added 19 points, Julius Randle scored 17 and Kyle Kuzma had 16 for the Lakers, who won their fourth straight. Los Angeles is 12-4 in its last 16 games, including eight in a row at home. Lakers coach Luke Walton wasn’t sure how the team would respond after the Lakers traded Jordan Clarkson and Larry Nance Jr. to the Cleveland Cavaliers for Isaiah Thomas, Channing Frye and a 2018 first-round pick earlier in the day. After a slow start, Walton got his answer. The Lakers closed the first quarter on a 22-8 run and turned an 11-point deficit into a lead they would not relinquish at 30-27 on a three-point play by Randle with 3.8 seconds left. ”I didn’t know how long it would take, but the energy before the game was already much better. I was curious to see how long it would take and if our guys would be able to perform after two of their teammates got traded away and, obviously, they did a nice job,” Walton said. After knocking off the Thunder 108-104 in Oklahoma City on Sunday, the Lakers breezed to a lead as large as 27 points in the fourth quarter. Rookie Josh Hart had 10 points, eight rebounds and five assists. Paul George scored 29 points for the Thunder, who played without Russell Westbrook and Carmelo Anthony as each was hampered by a sprained ankle. Steven Adams had 13 points and nine rebounds as the Thunder lost for the fifth time in six games. George started strong with 12 points in the opening 6:52, hitting his first five shots including three 3-pointers. He had 22 points at the break, making 8 of 14 shots from the field and 4 of 6 from the 3-point line, while the rest of the Oklahoma City lineup shot 27 percent (10 of 37). Thunder: Raymond Felton had seven points, five rebounds and three assists as he took Westbrook’s place in the starting lineup. Patrick Patterson, who replaced Anthony, was scoreless in 26 minutes. Jerami Grant and Alex Abrines each scored eight points. Lakers: G Lonzo Ball (left knee) missed his 12th straight game. With Thomas and Frye on expiring contracts, the Lakers now have a path to add two marquee players in free agency this summer or in 2019. Their fans made it clear who they would like to see join the team, giving George a loud ovation when he was introduced. Kuzma declined to say if he tried to sell George on joining the Lakers during the game. ”I don’t think we need any more fines,” Kuzma said with a laugh, referencing the $50,000 tampering fine the Lakers received for Magic Johnson’s praise of Milwaukee Bucks forward Giannis Antetokounmpo. Walton was so caught up in preparing for the Thunder that he had yet to begin figuring out how Thomas might fit in with the surging young roster. Walton hadn’t even spoken to Thomas, as the two traded voicemails in an attempt to reach one another. ”If there was no game today, then, yeah, most of today would have been spent watching film on him and calling people that I know around the league that may either have played with him or coached him and coming up with game plans,” Walton said. Thunder: Host the Memphis Grizzlies on Sunday. Lakers: Open a three-game trip at the Dallas Mavericks on Saturday.